Set in a post-civilization world where sentient robots are the among the only “people” left, this casual RPG, Robomaniac, not only lets you play as a robot but also to help it grow into a strong survivor in the somewhat dysfunctional dog-eat-dog society that these robots have created. 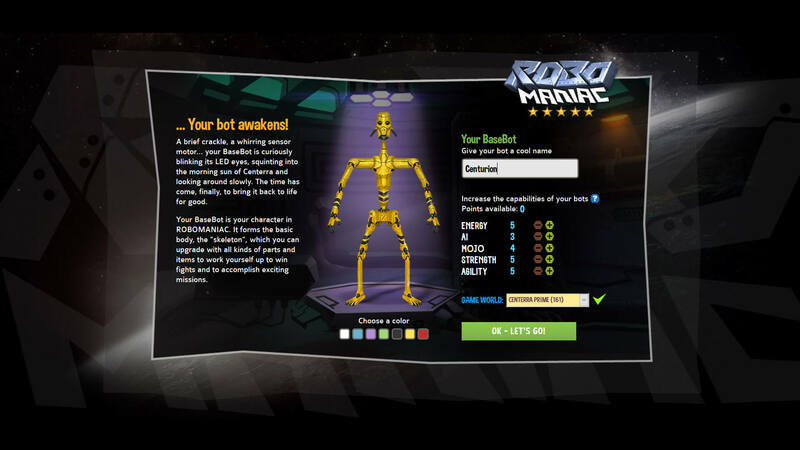 Customize your bot with the best gear you can buy, duel other bots for glory, fame and a pile of credits, or set off on exciting missions to rid various locations of bandit robots or other menacing creatures. Robomaniac is set in a post-civilization world where most humans have left the colonial planet of Centerra due to a massive apocalyptic level disaster caused by voluminous emissions of ionized magnesium, which resulted in a spike in life-threatening radiation. However, in doing so, they had to leave their tech behind, including robots they have created to build and defend their colonies, mainly because the robots were deactivated by the radiation and it would be really difficult to lug around these big metal constructs. 30 years later, once the radiation level dropped to normal, these robots start to wake up from what was then called “The Great Deactivation” and have begun building their own civilization from the ruins of the previous human civilization. 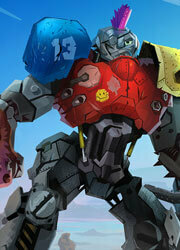 In this game, you play as one of the newly reactivated robots who’s ready to face the brave new world. 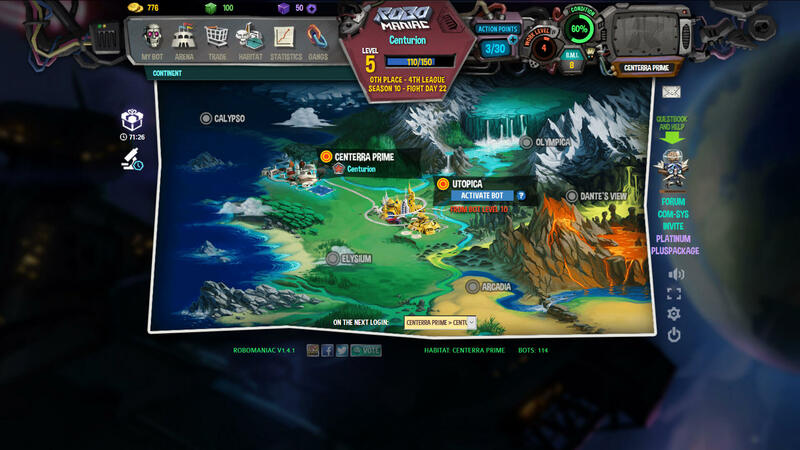 If you have played other browser-based casual RPGs like Hero Zero, then you should have a very good idea of how the game works, but for those who are new to this rather niche genre, let’s dive in and take a closer look at the game. To start, you’ll need to first create your starter (barebones) robot. 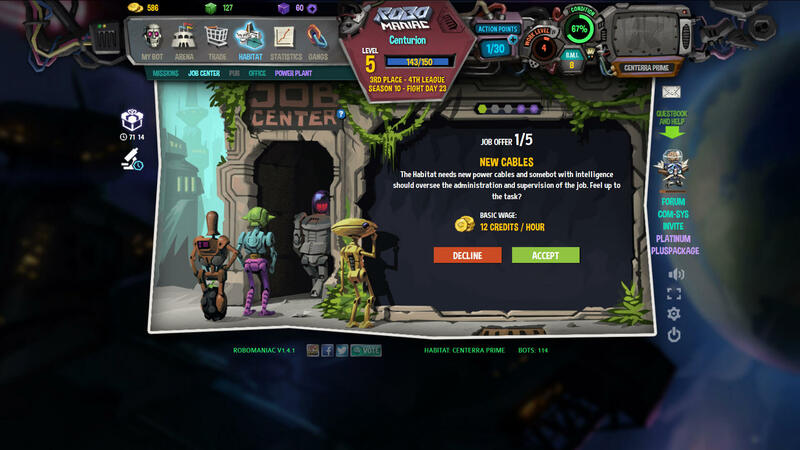 There isn’t a lot you can customize your robot with at first – just a palette of colors – but once you get into the game proper, you’ll be able to head over to the Junkyard to get some better stuff. Note that you can activate a robot for every server, so you can actually play multiple characters in this game. 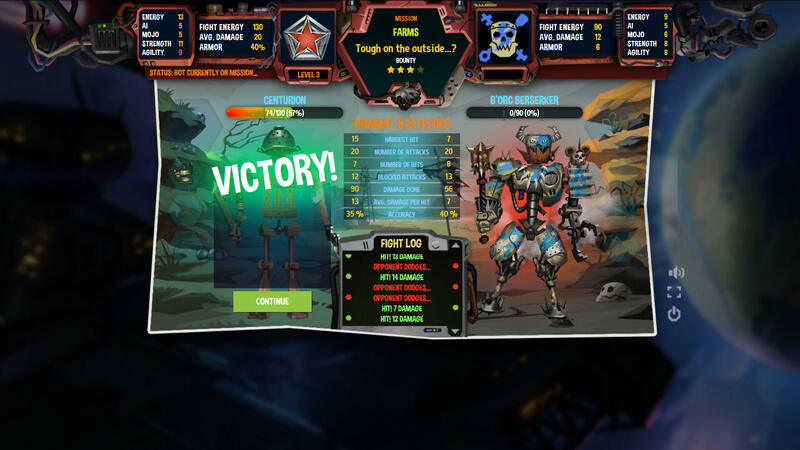 Operated by a cyborg called Scrappy, the Junkyard has a nice range of robot parts to offer, each of which will add a certain number of attributes to your overall stats and hence, increasing your Bot Mass Index or B.M.I. This index basically indicates how strong a bot is, so it’s wise to keep an eye on both your and your opponents’ B.M.I. before heading into a scuffle. 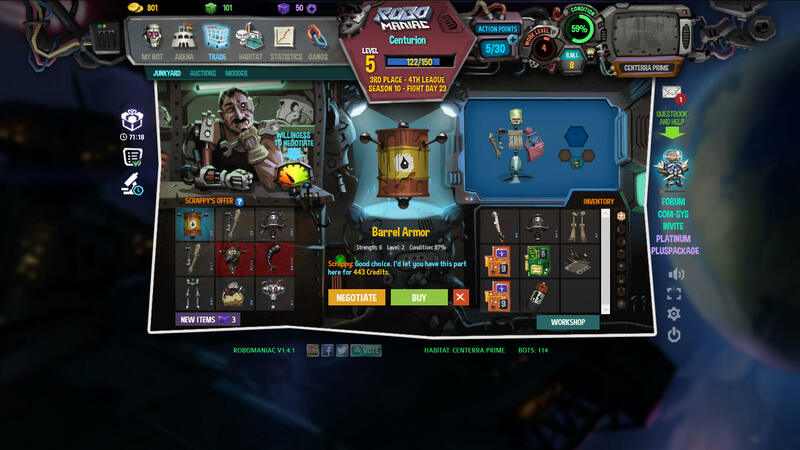 Now, buying items from the Junkyard is pretty straightforward, unlike bidding for an item at the auction or purchasing a skin at the Modder’s. However, the game spices things up by adding in a “Willingness to negotiate” meter. This meter lets you know how willing Scrappy is to negotiate on the price of an item you’re interested. Naturally, you’ll want to avoid negotiating when the meter’s anywhere near the red area of the meter. If a negotiation failed, Scrappy will simply boot you out of his store and you’ll need to wait 15 minutes before he will let you back in. Thankfully, you are given 10 free chances to “knock politely” and ask to be let back in before the wait-out duration expires. The robot parts you buy can then be equipped on your robot via the Workshop. 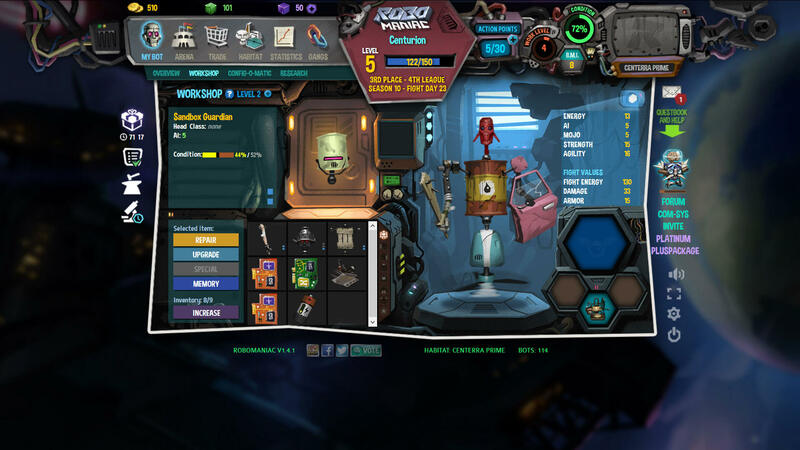 Here, you can use the Workbench (unlocks at level 3) to upgrade, modify, or repair worn robot parts as well. This also means that every item you equip has a durability level, called Condition. If the overall Condition of your robot parts is too low, your B.M.I. will suffer a penalty as a result. 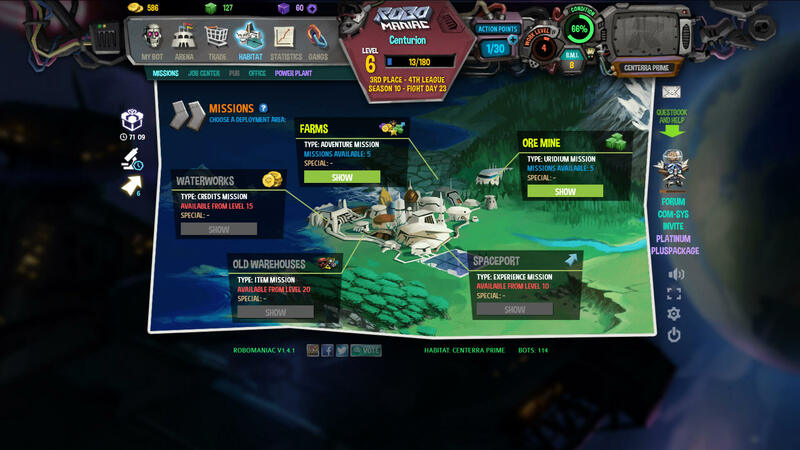 The tools you’ll have access to will increase as you conduct more research, allowing you to unlock higher level features and functions for not only your workshop but also the config-o-matic (which lets you customize your robot’s battle tactics), charisma circuits (increases your robot’s MOJO/ EQ-related attribute), and action reactor (which allows you to get some action points in return for every use). I’d like to also point out that leveling up in this game is quite interesting because the level-up process is not automatic. Instead, you have to click on the level-up icon, pick a level-up reward that you like (be it more credits, Uridiums or Action Points), and then you’ll get the 3 attribute points as your reward for advancing a level. As you might expect, most of these upgrades (except leveling up, of course) will cost you credits, especially if you plan on buying new robot parts, which you should. The easiest way to collect credits is possibly by battling other robots. 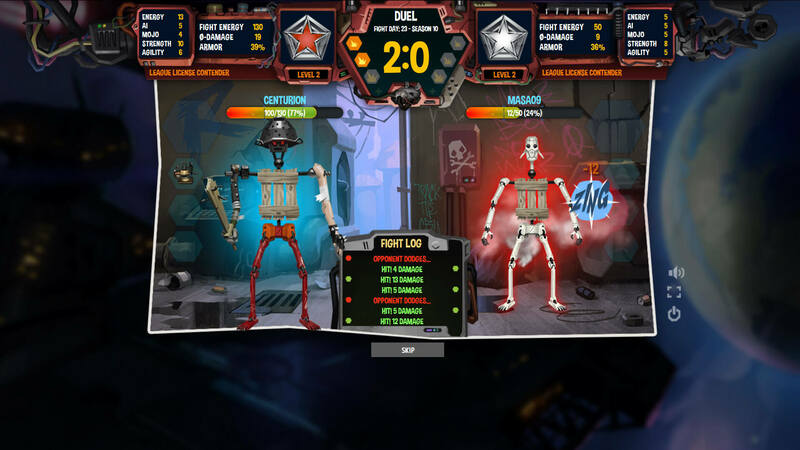 There are many ways you can do this – you can take on your opponents via the Dueling system, or if you fancy a bit of a challenge, you can head to the Underground and fight all 5 robots you are matchmade with to win a nice prize chest. Note that the turn-based combat in this game is automatic, so this makes having a good B.M.I. or in other words, good attributes and gear, even more important. Still not challenging enough? Well, once you got your League License after completing all the tutorial quests, you can engage in some “high-stakes” duels at the Metal Kings League which will ultimately determine your ranking in your league bracket. Your goal is, of course, to have the B.M.I. to advance to better and more lucrative league brackets. You can even embark on adventures to defend various robot Habitats by battling rogue robots or dangerous creatures and get paid in return. These adventures are rather interesting though, despite taking a bit of time to complete, because there will be special events that will pop up from time to time. These special events can be positive or negative – sometimes, they might give you some temporary attribute boost or penalty; at other times, you might just get some freebies. There are also situations where you will be asked to make a decision and your decision will naturally come with either positive or negative consequences. Do take note that for every adventure, you’ll have 5 missions to choose from, ranging from 1-star missions up to 5-stars. Depending on how well-equipped your robot is, you might want to click on the little arrows on the side to choose a more suitable mission in order to maximize the rewards you can get. Fights and missions will cost you action points and you have a limited number of them. Due to this, you might want to have another stuff you can do to earn credits, like picking up a job at the Job Center. This is more of an AFK (whenever you are ready to shut the game and go do something else) option to use though, as your robot will work even when you’re not around to supervise it. As Robomaniac is a freemium game, you can use the game’s premium currency, either Uridium or Platinum, to hasten your advancement through the game. You can purchase more premium currency via the Power Plant. However, as the game likes to insist, it is in no way a pay-to-win game. Even with premium, fair play is emphasized. Oh, and not to mention, the game does give nice gifts for newcomers – you can get a welcome gift containing 1000 credits, a 7-day PlusPackage (premium subscription), and 50 platinum. Like having a premium account due to the many perks you get? Well, you can follow-up your free 7-day subscription with a monthly subscription. 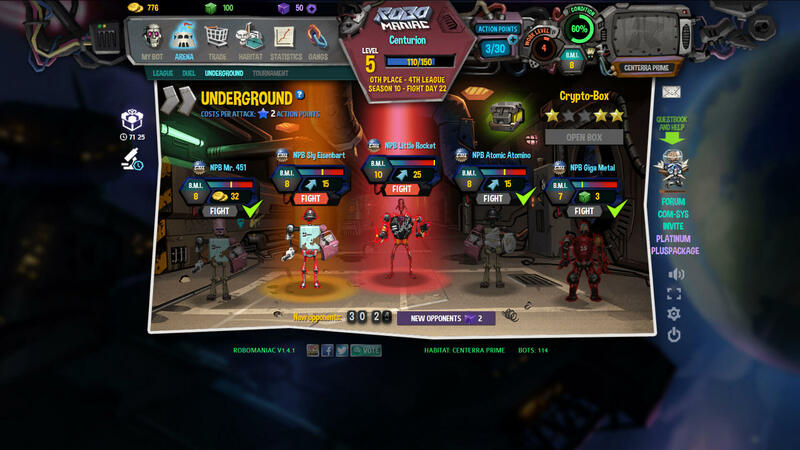 Like many such games, Robomaniac has a guild-like system, called Gangs, in place to cater to the social needs of its players. These robot gangs are often pitted against each other, and as such, most gangs would want to fill up their ranks with the best players. Make sure to stoke up your B.M.I. as much as you can before applying for one. The graphics in Robomaniac look really good, and as ridiculous as this may sound, the game’s appearance does somehow have a humorous feel to it... well, maybe it’s just the comic book-ish style. In terms of sound, the music in this game is pretty good I think. It has an ominous techy feeling, the sort of music you’d probably hear in a tech-inspired horror film like Black Mirror. I’m not a huge fan of the rock music it plays during combat, however – it can be a bit loud. For these instances, I’m thankful the game has a mute button. In short, Robomaniac has everything that has made casual RPGs like Hero Zero so addictive to play in addition being incredibly simple to get into. Granted that this genre of game isn’t everyone’s cup of tea, if you like to play an RPG in a casual capacity, then maybe you’d like to give this game a try. It doesn’t really take a lot of your time despite not being strictly in the “idle gaming” category. by Aethyna Mar 10, 2018 Set in a post-civilization world where sentient robots are the among the only “people” left, this casual RPG, Robomaniac, not only lets you play as a robot but also to help it grow into a strong survivor in the somewhat dysfunctional dog-eat-dog society that these robots have created. Read More Be the First to Post a Review!